Doors, windows and curtain walling manufactured by CMS Window Systems have been installed at a luxury Scotland retreat in its new spa and leisure complex. 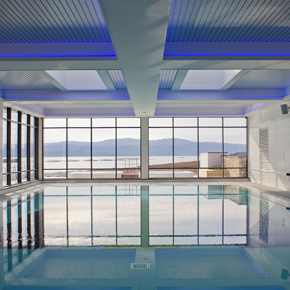 Portavadie Estates £10 million development includes a 16-metre indoor pool, outdoor spa pools, two Scandinavian saunas, fully equipped gymnasium and spa, café and the largest heated outdoor infinity pool in Scotland. Designed by architects Stewart Associates, the spa and leisure centre is powered by local sustainable technology and complements the existing marina development and leisure offering. CMS’ glazing solutions were specified to ensure that the facilities are open to the picturesque views across Loch Fyne across to the Isle of Arran, whilst flooding the building with natural light. CMS manufactured and installed all of the thermal enhanced curtain walling and windows for the building envelope. These were created using a combination of the SCW + system, Senior Hybrid Systems and the SPW600 system. The development also involved the installation of Metal Technology P50 louvres, colour coordinated in RAL 7015 with a matt finish. The glass specification incorporated toughened glass with a low E coating. In addition, the areas facing the water feature BIOCLEAN self-cleaning glass to help maintain the windows appearance in the long term. The glazing also incorporated glass spandrels in places, coloured to RAL 7021 to maintain consistent aesthetics. CMS was appointed by construction company and main contractor Ashleigh (Scotland) Ltd.
Euan Clark, Commercial Director at Ashleigh (Scotland) Ltd said: “As the design evolved, CMS were a key part of our tender discussions, providing cost and specification advice against client and design team proposals.